The Lasallian school nurtures in its members an awareness of the living presence of God in our world. It calls all to a deeper awareness of their saving relationship with a caring and loving God and moves all to see the world through the "eyes of faith." The Lasallian school calls its members to a solidarity with the poor and victims of injustice. It calls all to a life-long commitment to respond to their needs through programs of community service, advocacy, and justice education. The Lasallian school provides an education that prepares students not only to contribute to society but to transform it. It calls all to use their knowledge and talents to critically examine and engage the world in light of the message of the Gospel. 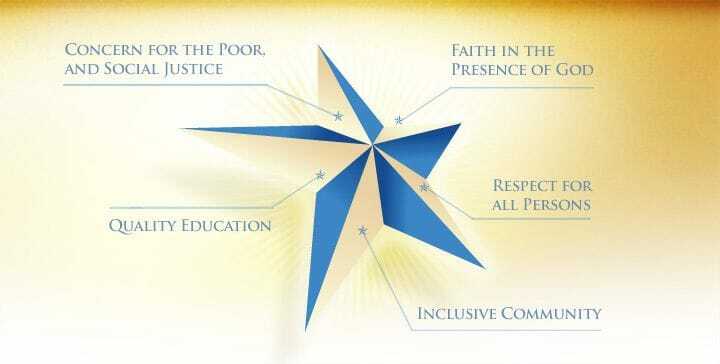 The Lasallian school engages its members in a concerted effort to respect the dignity of all persons. It calls all to respect-filled relationships as the heart of Lasallian education and a key expression of their identity as children of God. The Lasallian school is a united community where diversity is respected and no one is left out or left behind. It calls all to recognize and embrace one another's unique stories and qualities as unique and sacred features of the Body of Christ on earth.